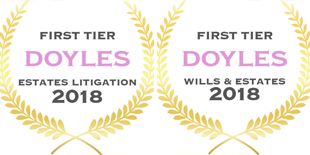 Cullen Macleod are pleased to announce that Doyle’s Guide, the leading directory for legal professionals and law firms, have acknowledged Cullen Macleod in their 2018 awards. Cullen Macleod are the sponsors of two awards at Edith Cowan University. Contract Law l – which is awarded to the student with the highest mark in the unit Contract Law l in semester 1. Contract Law ll – which is awarded to the student with the highest mark in the unit Contract Law ll in semester 2.